The family hit by a falling tree in Queenstown yesterday had only just arrived there that day for a holiday, a relative says. 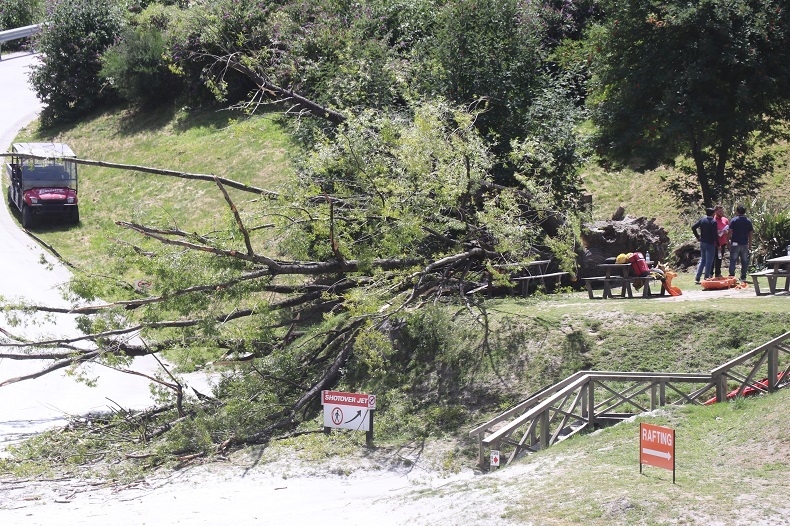 A 5-year-old and a younger child were both injured when the tree they were sitting under on the riverbank near Shotover Jet base fell over in a gust of wind. The family must wait and see how 5-year-old Delwen George will recover, but he has been conscious and was able to communicate with staff at Dunedin Hospital, cousin Johnson Joy said. Meanwhile his mother, Selma George, may take a year and a-half to completely heal from the accident, in which she suffered a fractured femur and a dislocated hip. She is going through her second surgery for her injuries later today. Joy said the baby girl also injured when the tree came down was in good health and was being held in hospital for observation. He said the family were visiting Queenstown from Wellington for a holiday and had only just flown in that morning. "They just went down to Shotover, sat on a bench, then it all happened . . . in two seconds this tree fell on top of them." Joy said the extended family is "a bit shocked" but that things were "getting better". Delwen's "lungs and heart got a bit of trauma" and his face was bruised. "There's a large branch of the tree that has struck him down." Doctors are observing him for 72 hours in the ICU, after which it is hoped he can be moved to a ward with his sister. "He's conscious, he recognises everyone." Another man who was not part of the family was also injured when the tree fell, but he has since been discharged from hospital. Joy wanted to thank the team at Shotover Jet as well as the members of the public who rushed to the family's aid and worked to free them from the tree as they waited for rescue services to arrive. He also wanted to thank emergency services and hospital staff.